The B.I.S. 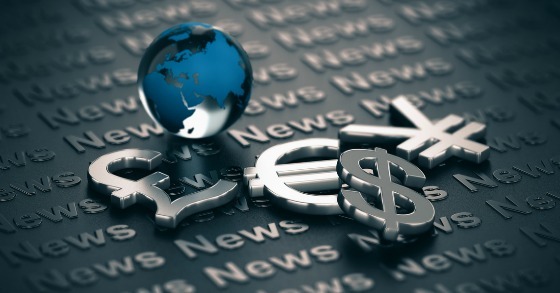 vs. Japan - Increase In Global Interest Rates?The B.I.S. vs. Japan - Increase In Global Interest Rates? The B.I.S. vs. Japan – Increase In Global Interest Rates? A few weeks ago I wrote about a B.I.S. report that hypothesized that global interest rates would rise over the next few decades as global demographics shift from a labor supply shock to a shortage as labor forces shrink in many developed countries. I mentioned that I would write about the interesting rebuttal written by Masaaki Shirakawa who was a Governor of the Bank of Japan between 2008 and 2013. Japan has been leading the industrial world in having to navigate through not only a shrinking labor force, but now a declining population as well. Unfortunately, with the flooding that took place in the aftermath of Hurricane Harvey, I focused on the much more immediate and pressing situation at hand in terms of communicating our experience in Houston. I then subsequently focused on a few more topics that were of interest to me. But I’m back to the Land of the Rising Sun and whether its demographic/inflation/interest rate experience is the model to strongly consider basing one’s interest rate decisions on or if the 36 year global downtrend in interest rates is now over and in the process of reversing itself for the reasons the B.I.S. authors articulate. Let’s review some of the challenging demographic headwinds Japan has been facing for many years now. 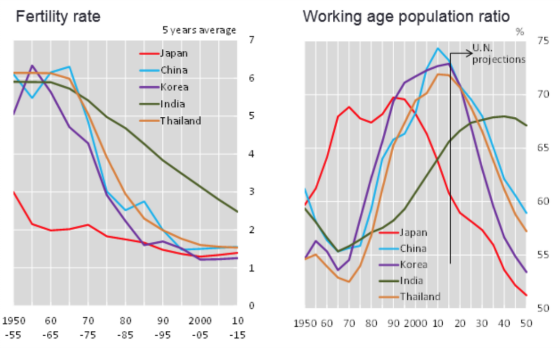 These first two charts depict the drop in the working age population and overall population on a percentage and absolute basis for Japan. This is not a pretty trend as both are now shrinking. The next two charts are interesting in the sense that the first one makes a lot of sense and the second is somewhat counterintuitive. 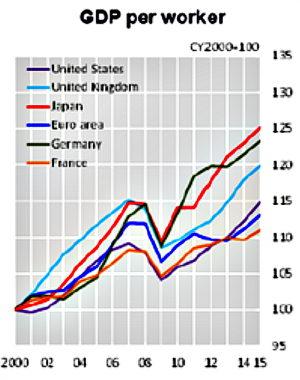 The first chart shows how this has led to Japan experiencing the slowest cumulative GDP growth among the United States, France, Germany, and the Euro area since 2000. This is not surprising as a reduced labor force means less available hours to produce goods and services unless people end up working longer or older people stay or re-enter the workforce in larger numbers. And unless productivity grows significantly, producing more becomes more challenging. 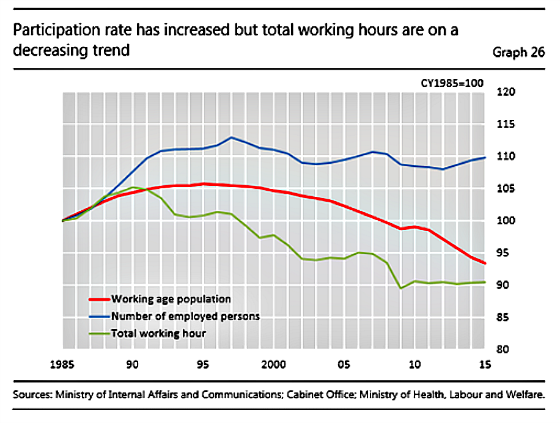 One can see that Japan’s total working hours have been shrinking despite the number of employed persons remaining flat. This means that a larger percentage of people are working part-time, which one would suspect if the labor force is increasingly represented by older people who have the option to not work full-time and yet the employers are still desirous of employing them and presumably enticing them with an acceptable wage. 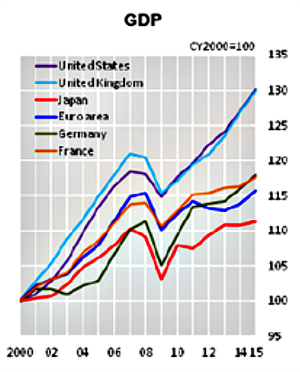 Japan fares much better, however, when the GDP data is looked at on a per capita basis. It has slightly outperformed Germany, which is also facing very challenging demographics as its population is aging rapidly, although this may be slightly mitigate by its recent willingness to take in a large number of Middle East refugees and immigrants. Japan is a very industrious, intelligent population, albeit one that is shrinking as the next two charts show. As a result, it can generate strong economic output per person. Limits force companies and countries to be more innovative. Japan is a poster child for this with its aggressive adoption of robots and other technology to make up for a shrinking workforce to serve what is still a very affluent population and global economy. 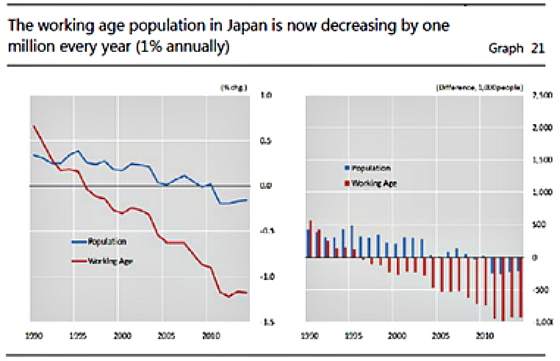 Japan is the proverbial “canary in the coal mine” when it comes to demographic trends, particularly in Asia. As the following charts show, other Asian countries are facing challenging growth prospects with declining fertility rates and working age population ratios. India by far has the best growth characteristics as its fertility rate is still above replacement and its working age population ratio is projected to grow in the short run and then flatten out through about 2045. The other countries are all experiencing declining working age population ratios which means that there are fewer workers to support the dependent young and old segments of society. And while the authors of the B.I.S. study believe that the world will start to experience higher inflation and interest rates due to a shrinking global labor force, or lower working age population ratio, I keep finding myself turning to Japan that has been experiencing these demographic trends since 1995 and during this time it has experienced either very modest core inflation that has peaked at 2%, or more typically, deflation as the following chart shows. And let’s not forget how aggressively the Japanese central bank has expanded its balance sheet to help monetize the Japanese government’s debt generated by the very large fiscal deficits as the second chart shows. The growth in the central bank’s balance sheet since 2013 has been quite astounding and still there is no inflation to speak of. that interest rates would have gone quite a bit higher. How wrong one would be in making this assertion. Since 1996, for all intents and purposes short-term interest rates in Japan have been less than 1% and they have been negative since early 2016. It is possible that Japan’s set of circumstances are unique to Japan and it would be a mistake to extrapolate them to the United States. And perhaps when the rest of the developed world follows suit that the cumulative impact of this may result in spending and investment exceeding savings and pushing inflation and interest rates higher. From my perspective, understanding this is one of the key determinants as to whether I will remain in the camp of being a variable rate borrower or strongly consider switching to fixed rate loans if I think the B.I.S. assessment is right. My bias is to bet on Japan leading the way versus the B.I.S. but I have to continue to delve more deeply into the B.I.S. hypothesis because I could very well be wrong and the stakes are quite high. Where is your bias? Japan or The B.I.S Report and why? Gary, Japan. Still no inflation.